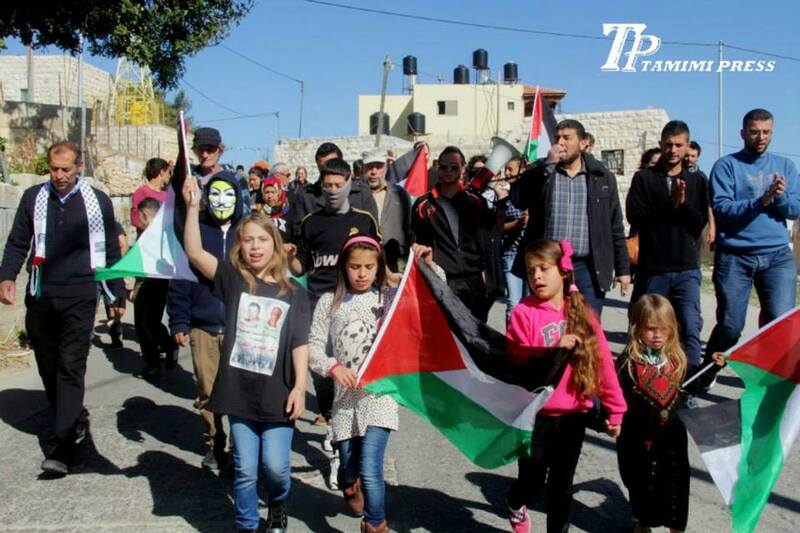 Nabi Saleh residents at the first Friday demonstration in 2014 stood in solidarity with the 18,000 Palestinian refugees trapped in Yarmouk refugee camp in Syria. The refugee camp has been under siege for the past year, with no electricity of heating for the past 12 months and no food or medicine able to enter the camp for 6 months. 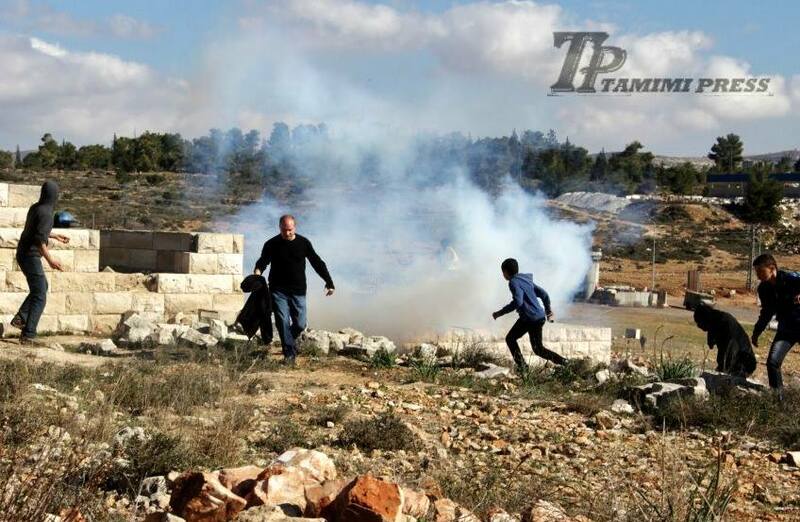 Activists at the demonstration in Nabi Saleh reported that two protesters have been shot by Israeli forces with rubber-coated steel bullets at the demonstration and that more than 500 tear gas canisters have been shot by Israeli Occupation Forces. Update 3th August: The fourth Israeli activist was released this morning at 5am. 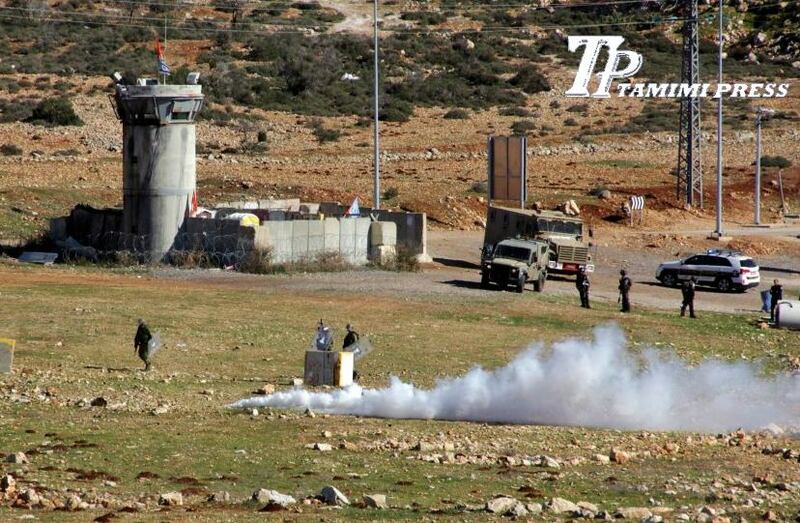 On Friday August 2, Israeli Border Police aggressively attacked protesters marching in Nabi Saleh’s weekly demonstration, shooting rubber-coated steel bullets and sound bombs at very short distances while arresting protesters and covering them in skunk water. The attack was initiated without any previous action from the demonstrators and resulted in the arrest of four Israeli activist. After midday prayer, around forty people, Palestinians together with Israeli and international activists, gathered in the village’s square, marched through Nabi Saleh’s streets and down the hill towards the stolen water spring. 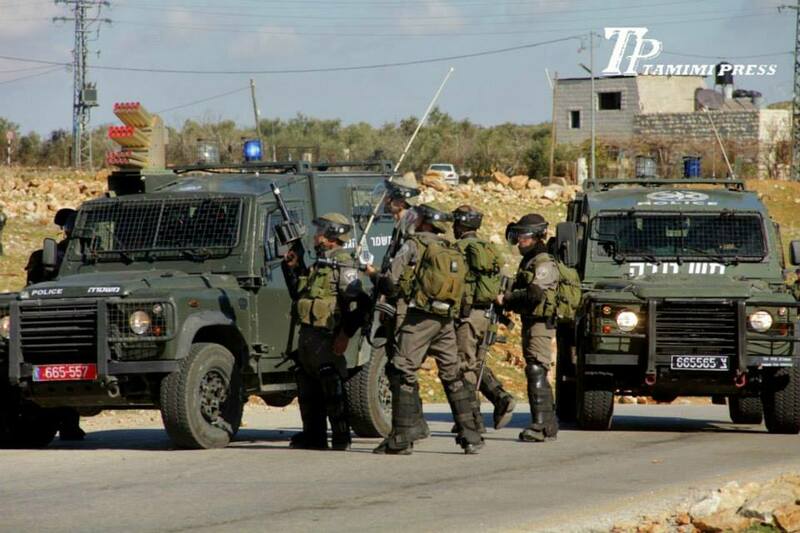 Israeli occupation forces were heavily present from the beginning and quickly charged at the demonstrators. 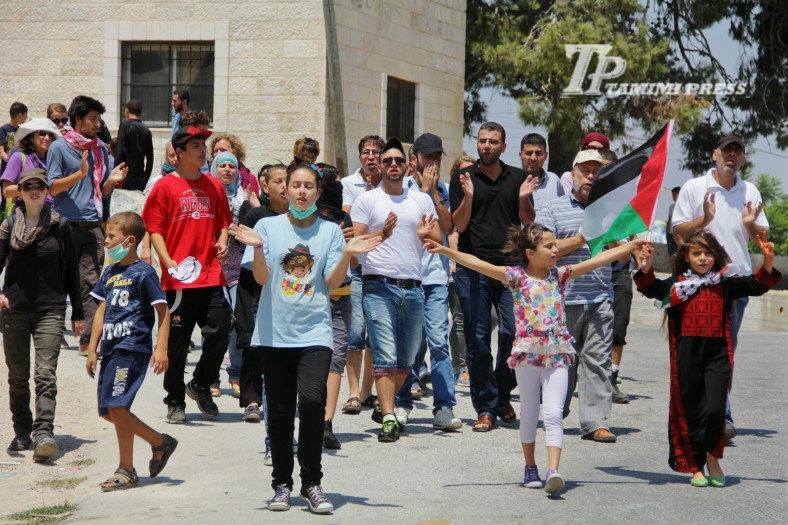 Invading the village, Israeli Border Police surrounded the protesters and without warning began firing rubber-coated steel bullets, sound bombs and skunk water at them. Though illegal by Israeli law, the rubber and plastic coated steel bullets were shot from distances down to 10meters, barely missing the heads of fleeing international activists. Despite the peaceful vibe of the protest, Israeli Border Police officers arrested four Israeli demonstrators and took them to the settlement nearby. One activist was humiliatingly handcuffed and blindfolded as he was taken away, in spite of him offering no resistance to the arrest. Three of the four activists were later released. 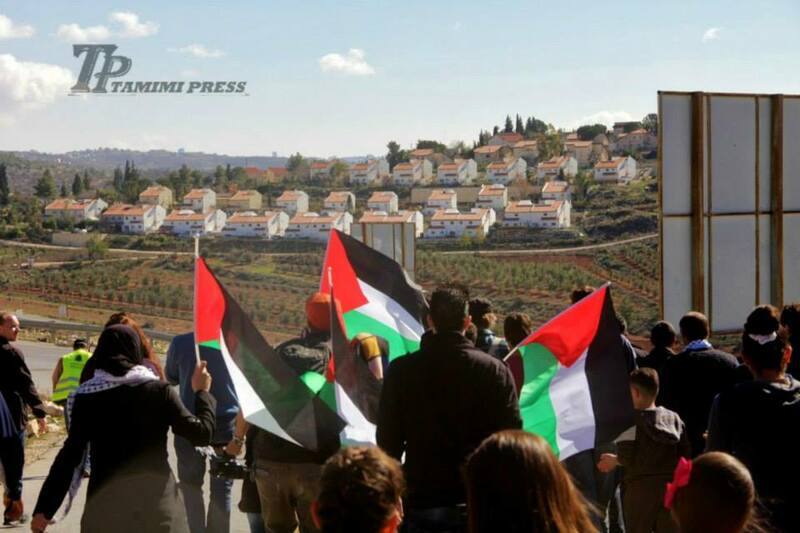 The village of Nabi Saleh has demonstrated against the theft of their natural spring by the nearby Halamish settlement and the occupation in general since December 2009. Israeli forces violently suppress the weekly Friday protests by shooting tear gas canisters, skunk water, sound bombs, rubber-coated steel bullets and even live ammunition at protesters. 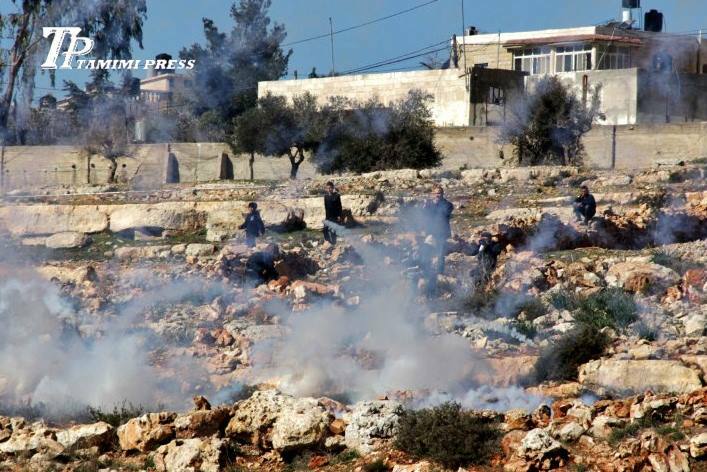 Two people have been killed, Mustafa and Rushdi Tamimi, and many others severely injured.